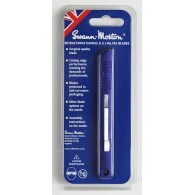 Especially with Craft 'Professionals' and enthusiasts in mind, Swann-Morton has produced the acrylic 5A handle with a nickel blade fitting that takes standard surgical blades. The 5A handle is supplied in a blister pack complete with 5 individually packed No. 10A blades.Pointed pliers should be used.. The Professional Range of blades and handles are produced with Craft 'Professionals' and enthusiasts in mind. 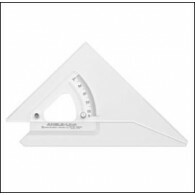 They are used in a variety of different industries from Mold Cutting and Jewellery Manufacture to Printing and Artwork. 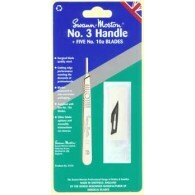 The No.3 handle is available for use with the small (No.3) fitment bla.. The Retractaway is a sleek graphite-finish metal handle offering the added safety of a hand retractable blade mechanism. 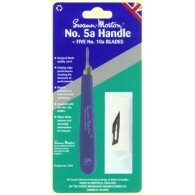 It is a highly versatile cutting tool produced with designers, graphic artists and model makers in mind. 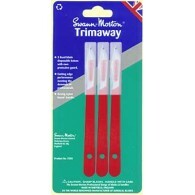 With easy blade changing it fits and safely retracts surgical blade No's 1..
Trimaway Purposely designed as an economic throwaway knife, the Trimaway has a strong nylon-based handle fitted with a fixed surgical quality heavy-duty No.25A blade and comes complete with guard. 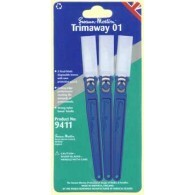 The Trimaway is particularly suitable for artwork, crafts and model making and the cutting edge require..